Cooktown, on the eastern coast of Cape York Peninsula, is 1600 km north of Brisbane and 650 km from Torres Strait. Cooktown grew rapidly as the nearest port for the Palmer River gold rush in the 1870s. By the 1880s, its population peak, one-fifth of its residents were Chinese. The town declined rapidly in the first two decades of the twentieth century and by the 1950s it was almost a ghost town. Tourism gradually came to its rescue. Its relative isolation and its spectacular setting on Cape York drew increasing numbers from the 1980s. Situated on the eastern side of the mouth of the Endeavour River, Cooktown was named after James Cook who explored the east coast of Australia in 1770. Cook was compelled to careen and repair his vessel, Endeavour, after holing it on reef coral. Cook and his crew remained at the Endeavour River for 48 days until August 1770, having occasional contact with local Aboriginal people. More than a century passed before Cooktown was established. In 1872 William and Frank Hann, pastoralists and explorers, were commissioned by the Queensland Government to explore Cape York with the possibility of finding gold north of the recently worked Etheridge fields. They found traces on the Palmer River, a stream rising on the western slopes of the Daintree National Park and flowing to the Gulf of Carpentaria. An experienced Etheridge prospector, James Mulligan, went to the Palmer in 1873 and found plentiful alluvial gold. Within a few months there was a rush, some miners coming overland and some by boat to the Endeavour inlet from where they walked 100 km to the goldfields. By April 1874 a tent town had formed at Endeavour Inlet, perched somewhat precariously between a mangrove shoreline and a granite ridge. Apart from numerous hotels and restaurants, there were a customs house, police barracks, post office and a Bank of New South Wales. 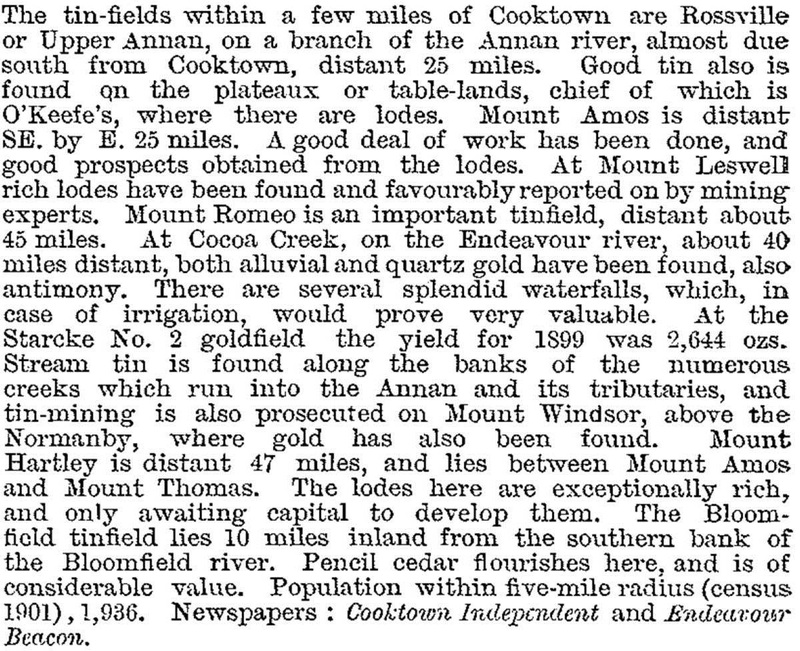 Known as Cooks Town, the name was changed to Cooktown on 1 June 1874. About that time Chinese miners arrived, their numbers quickly rising to about 20,000 working the Palmer goldfields. 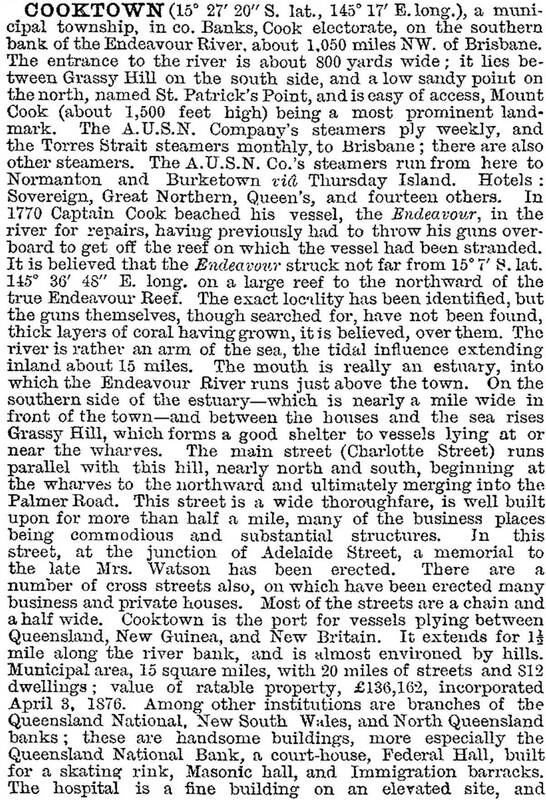 Some 3000 remained in Cooktown, where they established businesses around Adelaide Street. Cooktown made a strong impression nationally and even internationally. A Papal brief appointed Dr John Cani Vicar-Apostolic of North Queensland in 1878, headquartered at Cooktown. It was the first step in a remarkable presence, as the Rev J Hutchinson, first Bishop of Cooktown (1887-97), built a grand convent and boarding school for the Sisters of Mercy. The Bank of New South Wales must also have considered Cooktown to be important, as its two storeyed banking chamber almost equalled the convent in magnificence. As well as the Palmer gold workings there were timber cutting and some farming inland from Cooktown. Packhorse and other costly forms of freight carriage persuaded the community to build an inland railway. A wharf line (1884) and 50 km of track from Cooktown to Normanby were in operation by 1885. Extensions to Laura were completed in part in the 1890s, with the opening of a five-span iron lattice girder bridge on reinforced concrete columns over the Laura River. It was used only once by a test train. Gold yields had slumped and the whole line was declared a white elephant. When the railway project started, however, Cooktown was approaching the heights of its commercial success. Tin deposits at Annan River, south of the town, were found in 1885, making up for declining alluvial gold yields. In addition, Burns Philp launched much of its New Guinea trade from Cooktown's harbour. Cooktown's residents had set aside funds for a botanic garden (1878) and for memorials to Captain Cook and Mary Watson, the heroine who perished in her escape from Lizard Island. Despite Cooktown's awkward terrain the streets were wide, and the gullies filled in with locally crushed granite. The port extended over 2 km along the river, the town hall was spacious and the hospital had 80 beds (1894). A school of arts had nearly 1900 books and a mineral and curio collection, and the Federal Hall had a skating rink. There were plans for a cigar factory, using locally grown tobacco, but these came to nothing. The surrounding area was under the Daintree divisional board which met next to the school of arts. By the early 1900s Cooktown's best times had passed. A cyclone in 1907 destroyed or unroofed many buildings, including the Masonic Temple, the Presbyterian and Catholic churches and ten hotels. Many commercial buildings were rebuilt, but houses were abandoned as the population drifted to Cairns. Further damage occurred in a fire in 1919. Old-timers reminiscing in the 1930s dreamt of new Palmer gold strikes, but the economy relied on timber, limited agriculture, and tin mining which had a few more seasons to run. A commercial Cairns-Cooktown air service began in 1934, but reading by hurricane lamp continued until the 1950s, when electricity was connected. The population census recorded barely 400 people in 1947. Two years later more buildings were destroyed by cyclone, but several of them were by then derelict. During World War II the convent and school were taken over for military purposes. As Catholic authority had been transferred to Cairns in 1941 and the convent's Sisters evacuated, the buildings were left unoccupied from after the war until 1969, when tenders were called for demolition. Local pride wanted the buildings saved, and they were restored and opened in the Cook bicentennial year, 1970, as the James Cook Historical Museum, operated by the National Trust of Queensland. The restoration coincided with an increasing interest in far north tourism, four wheel drive adventurers and an increasing appreciation of the extensive national parks and Aboriginal cave art within the Hopevale Aboriginal Community. The Cooktown and District Historical Society, which specialises in local genealogy, occupies the Queensland National Bank Building, as a museum for Cooktown history. Tourists were unable to experience a vintage steam train ride. The Laura railway had been unaccountably kept running until 1961, at an estimated loss of £1.4 million over its 76 years of existence. A daily air service from Cairns has operated intermittently since 1947. In the 1980s it took six hours to drive from Cairns, the nearest commuter airport, to Cooktown on a rough gravel road. Today the trip can be undertaken on a sealed road in three hours. The Sovereign Hotel has been turned into a glamorous resort establishment. Cooktown has numerous hotels and motels, a hospital, bowling, golf and turf clubs, State primary and secondary schools, an historic cemetery and nearby Chinese shrine, three churches and an aerodrome 10 km out of town. The museums and botanic garden are key attractions, along with the heritage-listed lighthouse (1886) and lookout on Grassy Hill. An information centre and environment display are in the botanic garden. The Cook Shire office is in the former post and telegraph office (1877). The shire office and the shire hall are listed on the Queensland heritage register, along with 12 other sites. Charlotte Street is the main heritage precinct, often thronged with tourists. Cyclone Ita hit Cooktown in April 2014 causing significant damage to about 50 fifty buildings.